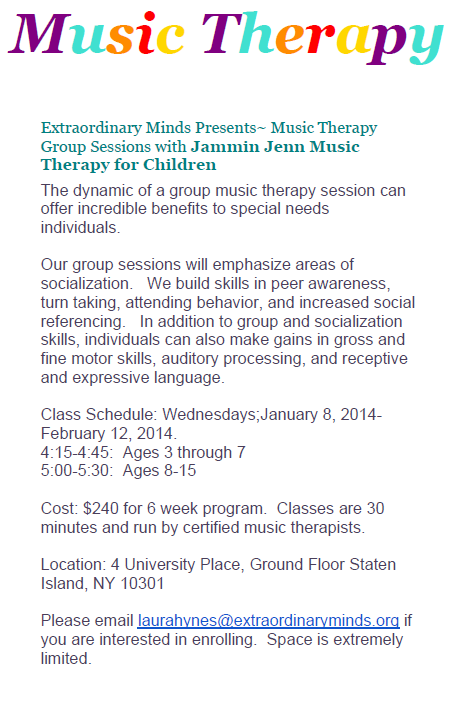 Jammin’ Jenn Music Therapy is very pleased to announce a group music therapy program we are running in early 2014. In our work we come across some fantastic organizations doing great work with children that have special needs. We are very proud to be running a group with Laura Hynes of Extraordinary Minds in Staten Island, New York. Please click on the flyer below to learn more about this program. If you are in the Staten Island area please join us! We are planning on rockin’ n’ rollin’ and conducting some outstanding music therapy. This entry was posted in Children and tagged group music therapy. Bookmark the permalink.